Today’s lawlessness in America and around the world can be traced to a widespread disrespect for Divine Law. Lacking a fear of God brings contempt for human law. The psalmist said it best, “There is no fear of God before their eyes” (Psalm 36:1). Setting the Law against Grace is also problematic. The Law and Grace, as introduced in Scripture, are in harmony with God’s plan for all Believers (“Believers” is short for “believers in Yeshua/Jesus as Messiah.”) Most Believers consider our current era as the “Age of Grace,” which causes misunderstanding for anyone who supposes that Grace did not operate in any other era. Grace is not exclusive to our day; it was present in the beginning but was fully manifested in Jesus/Yeshua. When John declared that the Law was given by Moses but that Grace came by Jesus Christ, he was not contrasting Law and Grace as two irreconcilable systems, but as two parts related in one system. “For the Law was given through Moses, but grace and truth came through Jesus Christ” (John 1:17). Think of a train track. Grace is one rail and Law is the other. Both are necessary to move the train forward — so it is with Grace and Law. Grace was in operation from the beginning of time. In Eden, God redeemed Adam and Eve after the fall by His grace, even as His law (not yet communicated) was satisfied by a sacrifice to cover the couple’s nakedness. “Also for Adam and his wife, the Lord God made tunics of skin, and clothed them” (Genesis 3:21). All redemption is a product of Grace. Israel’s deliverance out of Egypt under the blood of the slain lamb constituted a symbol of God’s grace. The Law, or Ten Commandments, added at Sinai provided a necessary standard of life by which redeemed people should live. A redeemed Israel received the Law as a guide in their new relationship with God. It is imperative to understand that Old Testament saints and New Testament saints are both saved in the same way — by the grace of God through faith in Jesus Christ alone. The wonderful story of Grace is that it came, not to oppose the Law and replace it with another plan, but to satisfy all its claims and fulfill its obligations. The Bible is not merely for Israel, or the Church, but is a written revelation from God to all of His creation. What Law are we talking about? The New Testament gives readers three different expressions of Law. The Law of God expresses His mind and is binding on all God’s sentient creation. It is the unchanging moral standard of God that regulates the conduct of man. This Law has never been cancelled, and in reality cannot be. Obedience to the Law of God is man’s first duty and is why the first statutes God gave to Israel were the Ten Commandments — the moral law. The Law’s importance caused Jesus to address it in His first sermon in the New Testament: “Think not that I am come to destroy the Law, or the prophets: I am not come to destroy, but to fulfill” (Matthew 5:17). The Law of Moses required circumcision to be performed on the 8th day, even if it was a Sabbath. Jesus had been questioned about His healing of the paralytic at Bethesda on the Sabbath. He made a man whole. How could that be wrong? The Law of Moses comprises the entire system of legislation — judicial and ceremonial — that God gave to Israel during their time in the wilderness. The Law of Moses was binding on the Israelites, but not on the gentiles. The Law of Christ is God’s moral law expressed by Yeshua, our Mediator. It is the Law in His heart. “I delight to do Your will, O my God, and Your law is within my heart” (Psalm 40:8). As redeemed sinners, we are “bond servants of Christ, doing the will of God” (Ephesians 6:6b). As God’s creation, we are still under obligation to obey the moral Law of God; but as redeemed men and women, we belong to Yeshua, our Mediator. “And the Lord said to Moses, ‘Cut two tablets of stone like the first ones, and I will write on these tablets the words that were on the first tablets which you broke’” (Exodus 34:1). The Ten Commandments are the expression of the unchanging character and will of God. They prescribe our moral standard of conduct, not to be discarded. These principles are binding on every Christian. Yeshua did not come to introduce another plan, but to satisfy all the requirements of the Law. “Do not think that I came to destroy the Law or the prophets. I did not come to destroy but to fulfill. For assuredly, I say to you, till heaven and earth pass away, one jot [Hebrew Yod — the smallest letter] or one tittle [the smallest stroke in a Hebrew letter] will by no means pass from the law till all is fulfilled” (Matthew 5:17–18). Yeshua was very clear that He had not come to destroy the Law of God (moral code of God), but to complete the Law of Moses (the sacrificial law) in order to redeem His people. The Law of God still stands with all its Divine authority; and if the Law still abides as the unchanging expression of God’s character and will, then every human creature is under the lasting obligation to obey it. Believers are freed from the curse of the judicial law (Law of Moses), but are to continually live according to the Law of Christ — the moral code of God. The Law is God’s unchanging standard of conduct for all people; Believers and unbelievers. At the end of the Age, judgment will be meted out to all. For unbelievers, it will measure their punishment; for believers in Yeshua, it will measure their rewards to be enjoyed in Heaven. “I charge you therefore before God and the Lord Jesus Christ, who will judge the living and the dead at His appearing and His kingdom …” (2 Timothy 4:1). The judicial law was satisfied when Yeshua paid the penalty for our sin with His sacrifice on the cross. But, the moral law continues as our guide as we live under redemptive Grace. Your continued generous support of Zola Levitt Ministries empowers our unique approach to Bible teaching. On-site Biblical teaching from our Jewish friends in Israel gives an unparalleled perspective to you, our loyal viewer, and also to curious Jewish passersby who stop channel surfing to watch our captivating lessons. ZLM’s film crew has given many discreet witnesses to Holy Land bystanders. P.S. Living in the liberty of Grace that God has provided should be compelling for Believers; but we should live in that liberty with a constant reminder of the sacrifice that Yeshua paid to liberate us from the judicial law. For questions and itinerary details, please contact Zola Tours manager, Sandra, at 214-696-9760, email her at travel@levitt.com, or visit levitt.com/tours. We thank Tony for his in-depth study of Law vs. Grace. We both are honored to be on the ministry’s team with him. Kirsten and I love being part of Zola Levitt Ministries. One highlight of this ministry involves offering two tours each year to the Holy Land. The next tour is in spring 2018. The good news? It’s not too late to sign up for this incredible tour to Israel — following Jesus/Yeshua’s steps — and Petra, the Rose-Red City carved into pink sandstone cliffs. We will be your hosts, but you will be taught by the best Jewish Messianic teachers Israel has to offer. In true Zola Levitt fashion, we are learning the language — yes, Kirsten and I are learning right along with you — from Believers in Israel who speak the language every day. Please come with us to see God’s land, speak the language Yeshua spoke, and walk where Yeshua walked. You’ll also have opportunities to shop for Dead Sea and olive wood products. Please see tour dates and contact information above. We hope you are enjoying the new format for Zola Levitt Presents. Each weekly program is specially crafted to provide a special guest analyst in a “round table” chat at the conclusion. We’ve really enjoyed our time with Dr. Jeffrey Seif. Todah Rabah, Dr. Seif! 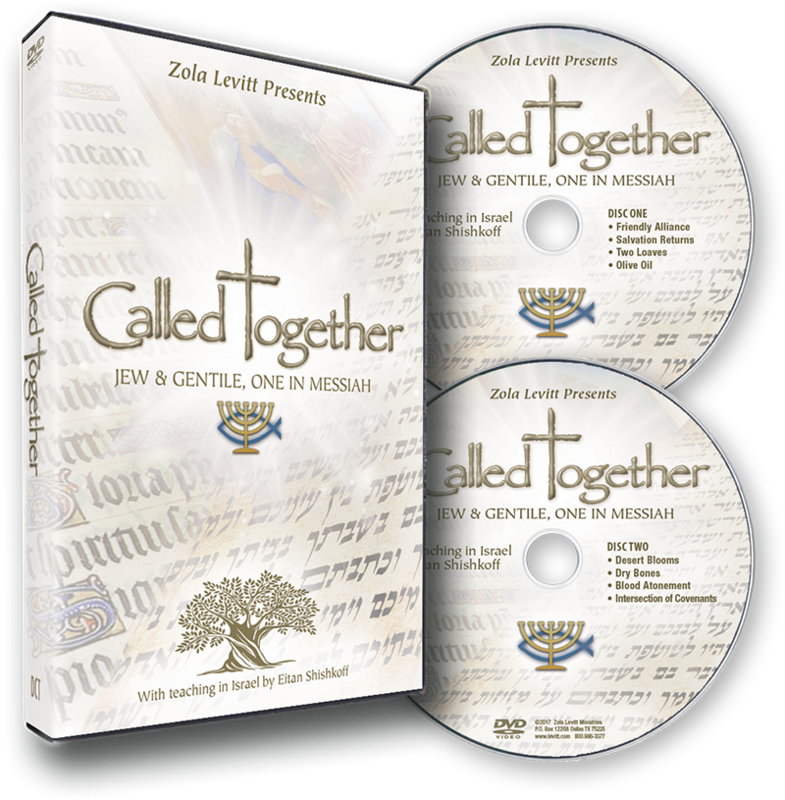 Called Together focuses on how gentile Christians are increasingly recognizing their Messianic brothers and sisters (Jewish believers in Jesus/Yeshua) as “natural olive branches.” The Lord calls us to work together to bring the Messiah especially to the House of Israel. From the studio, David and Kirsten Hart present these eight programs that feature on-location Bible teaching from “Our Man in Haifa” Eitan Shishkoff, reports from Chaim Malespin, and Hebrew lessons from Diana Frenkel. Guest analyst Dr. Jeffrey Seif helps us apply these teachings to our lives. We review the history of the Temple Mount from the threshing floor of David’s day up to the present and look at the possibility of a Third Temple, which could usher in the End Times. We hear from archaeological writer Randall Price, radio personality Jeremy Gimpel, and newsman Bill Koenig. Myles interviews Rabbi Yehuda Glick. Jimmy DeYoung inspires viewers with his hope, and David Rubin recounts the Bible’s history of Shiloh. The Lord uses heavenly signs to show humans what He is doing, where He is going, and what He asks of us. We hear from Mark Hitchcock, a leading prophecy authority. I am thankful that our Jewish Messiah freed us Believers from the penalty of the Law and brought Grace, enabling us to keep the moral Law of God.